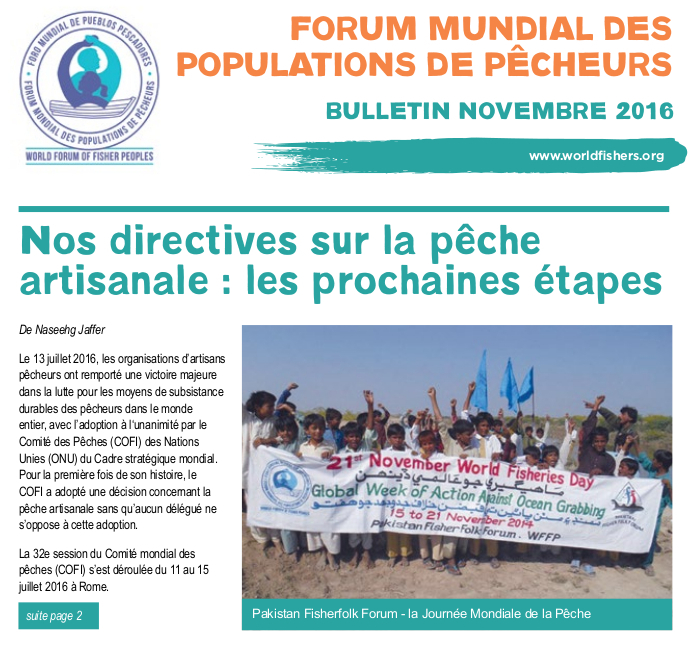 A new report, The Global Ocean Grab, was published by the Transnational Institute, Masifundise and Afrika Kontakt together with WFFP. 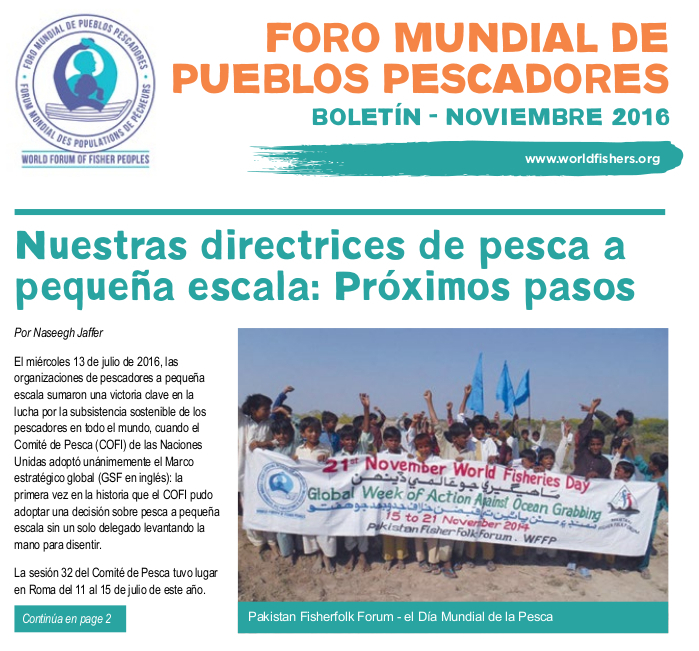 The term ‘ocean grabbing’ aims to cast new light on important processes that are negatively affecting the people and communities whose way of life and cultural identity depend on small-scale fishing and related activities. 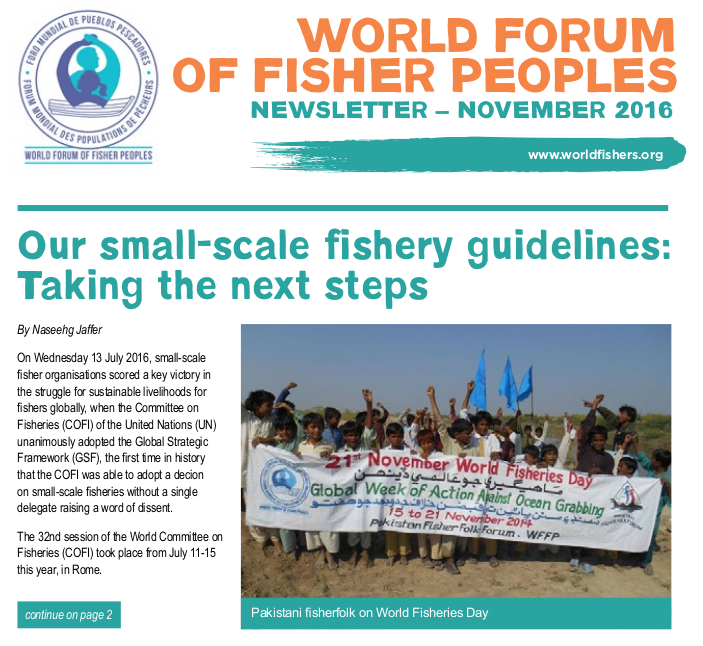 Small-scale fishers and fishing communities in both the Global South and the Global North are increasingly threatened by powerful forces that are dramatically reshaping existing access rights regimes and production models in fisheries. This process is leading not only to the dwindling of control by small-scale fishers over these resources, but also in many cases to their ecological destruction and very disappearance. Ocean grabbing is not only about fisheries policy. It is unfolding worldwide across an array of contexts including marine and coastal seawaters, inland waters, rivers and lakes, deltas and wetlands, mangroves and coral reefs. The means by which fishing communities are dispossessed of the resources upon which they have traditionally depended is likewise taking many shapes and forms. It occurs through mechanisms as diverse as (inter)national fisheries governance and trade and investment policies, designated terrestrial, coastal and marine ‘no-take’ conservation areas, (eco)tourism and energy policies, finance speculation, and the expanding operations of the global food and fish industry, including large-scale aquaculture, among others. 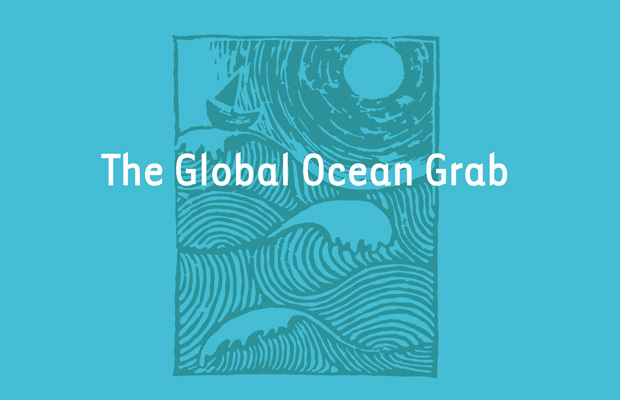 Meanwhile, ocean grabbing is entering a dramatically new and heightened phase with the emergence in 2012 of the Global Partnership for Oceans, a World Bank-led initiative seeking the privatisation of property rights regimes to aquatic resources and top-down market-based conservation blueprints.